Many martyrs who suffered death under Emperor Nero (r. 54-68). 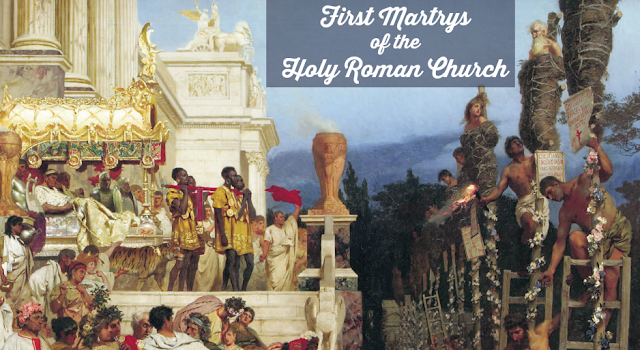 Owing to their executions durin the reign of Nero, they are called the Neronian Martyrs, and they are also termed "the Protomartys of Rome," being honored by the site in the Vatican City called the Piazza of the Protomartyrs. These early Christians were disciples of the Apostles, and they endured hideous tortures and ghastly deaths following the burning of Rome in the infamous fire of 62. Their dignity in suffering, and their fervor to the end, did not provide Nero or the Romans with the public diversion desired. Instead, the faith was firmly planted in the Eternal City.